A chilling breeze was whistling through the ballpark last Thursday evening as two last-place teams, the White Sox and Rangers, faced off in the first of a four-game series. The temperature was mired in the mid-50s on this school night. Starting pitchers James Shields for the Sox and Doug Fister for Texas are both in their mid-30s with far more baseball behind rather than in front of them. If ever there was a ho-hum match-up, this was it. Was there any rational explanation why 17,666 fans showed up as witnesses? Was it the "Ricky's Boys Don't Quit" t-shirts? Or the opportunity to see if the Sox could break out of their slump at home where their record was 3-15? Not only were these folks present, but the energy and enthusiasm was palpable, especially when manager Ricky Renteria removed Shields with one out in the top of the eighth inning with the Rangers holding a slim 1-0 lead. Shields mastered the Rangers, allowing only three hits, walking two and striking out eight. In parts of three seasons on the South Side, the man known as Big Game has a 10-23 record with an ERA of a whopping 5.78. Needless to say, Shields has exited games as a member of the White Sox way earlier than last Thursday, usually to a chorus of negative reactions. The previous sentence was written in the interest of kindness. But not Thursday. The fans rose to their feet, hailing Big Game for a performance seldom seen so far this season. Of course, reliever Luis Avilan soon yielded a run-producing triple to Nomar Mazara, and few in the crowd could have predicted what happened minutes later. Yes, the Sox mounted a totally unexpected late-inning rally helped by the Rangers who played like, well, a last-place ballclub. An error, a passed ball, three walks - one to Nicky Delmonico with the bases loaded on a 3-2 count that home plate umpire Paul Nauert clearly got wrong - preceded a base hit by catcher Welington Castillo that scored two runs, giving the Sox a 4-2 lead. Did I mention that all this occurred after two outs? By the time Nate Jones was nailing down the save with runners on second and third, the crowd, most of whom had stuck around, was on its feet, cheering, clamoring, begging, and imploring Jones to close out the Rangers. He responded by striking out Delino DeShields to end a game that meant almost nothing in the standings. You wouldn't know it from the fans' behavior. This was more like a September contest with two teams fighting for a playoff position. Sitting (and standing) in short left field, Box 147 to be exact, we were surrounded both by rabid Sox fans and others like Erica, an Indians' fan, who was sitting behind us. "I love watching baseball," she said. "I love going to a baseball game." She was there to introduce her friend Darwin Rios, a Honduran, to a totally unfamiliar sport. He might not have understood it all, but a hot dog and beer clearly fostered an appreciation for being present. "This is his first baseball game, and because it's always been important to me, I wanted to bring him to see what baseball's all about even though it's the worst team and it is freezing," Erica said. Down the row sat the Marantz family of four, who live in Andersonville. Similar to Erica and Darwin, they have no close ties to the White Sox. Dad Craig was raised in Los Angeles, and he likes the Dodgers. They had bid on and won a voucher at a benefit fundraiser for Victory Gardens Theater, and "this seemed like a good night to come," said Craig, ignoring the fact that they could have chosen a warm summer night when a good team provided the opposition. "We don't have plans to come to another one," admitted Marantz, "but we could. It's fun. These are nice seats. I know the Sox are up-and-coming. There will be some good days and bad days. But they have good players, young and talented like Yoan Moncada. "They say the food's really good here," Marantz pointed out. "They're not lying." Moving across the aisle, wearing his Sox regalia, was Ignacio Villalobos of Hickory Hills, who already had been to six games in this young season. "I knew it was going to be bad this year, but I'm supportive," said Villalobos, whose father took him to his first Sox game in the mid-80s. "I know it's going to take a couple of years. Everybody says it's going to be 2020. I say 2021." No doubt the Sox' appalling start to the season made Villalobos adjust his prediction of just how long the rebuild will take. "We got 10 wins," Ignacio pointed out. "I thought maybe we were going to have 20 wins [by now]. I didn't know we were going to be this bad." 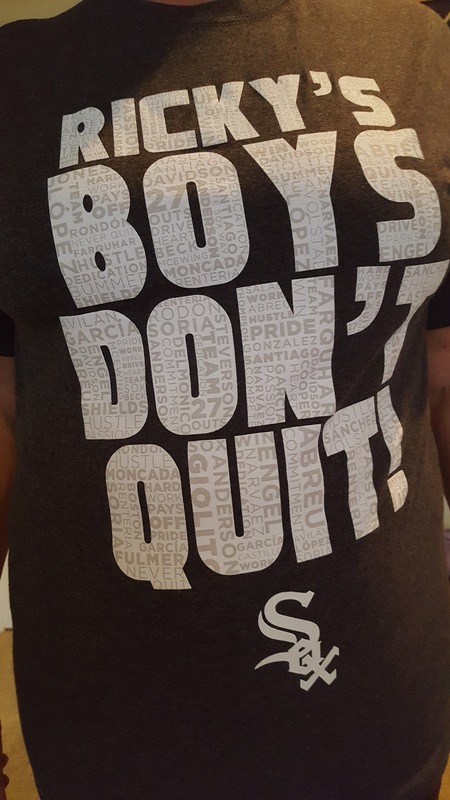 Does Villalobos think Renteria is the man to lead the White Sox back to respectability? "I like him. I'm Latino. He's Latino," said Villalobos who grew up on the South Side. "He relates to the players. There are some boneheaded plays that I don't like, and there's plays that I do like. But I don't know, maybe in about two years they might be making a move. It's just the way it is. You know what they say, 'Nice guys finish last.' He's a nice guy." Making the trip from Mokena were Dean Reszel and Bob Smith with his son Zach. Smith said he was "born with a Sox hat on," while Reszel said, "I'm 63-years-old so I've been a Sox fan since I knew what baseball was." Each believes in the rebuild. "Got to be patient," said Smith. "It's frustrating. You just got to be patient," while Reszel added, "I think it's going to be fine, but I thought they'd be close to .500 [at this time]." Prior to the season Dean thought the Sox would win 70 to 75 games. Right before Avilan relieved Shields, Dean bemoaned the fact that the bullpen has given away so many games. "It's been terrible," he said. "The Sox have lost like 13 games this year when they've had the lead." Actually the Sox have dropped 14 games where they have led at some point, but about half of those losses can be pinned on starting pitchers who haven't been able to hold onto early leads. Both Reszel and Smith go to about 15 Sox games a season. However, what's most impressive is that Smith has attended every Opening Day since 1967. That's 52 straight for those keeping score at home. Reszel said he's been at 28 of the last 32 openers. Neither thinks that Renteria will be a long-term Sox manager. "I'm looking at Omar Vizquel," said Smith, referring to the future Hall of Famer who is the Sox manager at Single-A Winston-Salem. "Yeah, he'll be the next manager," Reszel agreed. The Rebuild stalled a bit on Friday as Carson Fulmer earned a trip to Charlotte by throwing 75 pitches - 38 for strikes and 37 for balls - in two-plus innings before Renteria gave him the hook and a plane ticket. Poor Fulmer was charged with eight runs although he was relieved by Chris Volstad who, after getting two outs, yielded a grand slam home run to Shin-Soo Choo. But things were back on track over the weekend, thanks to six innings of decent pitching by Lucas Giolito, who got his third win in a 5-3 Sox victory on Saturday before Reynaldo Lopez shut out the Rangers on two hits over eight innings as the Sox triumphed 3-0. Lefthander Jace Fry got the save on Sunday. He's been scary good, having pitched eight-plus innings over seven games without giving up a hit while striking out 12. A third-round draft choice in 2014 out of Oregon State, Fry is just 24, has a marvelous command of his breaking ball, walking just two batters in almost 15 innings this season between Charlotte and the South Side. Who knew? There was more good news as Carlos Rodon threw his first pitch in competition at low Single-A Kannapolis on Saturday, hurling five innings and 65 pitches. He walked none while striking out six and allowing a lone run. A start at Charlotte probably is next, and we could see Rodon in Chicago in the next couple of weeks. In addition, the Sox' next opponent is another cellar-dweller, the Baltimore Orioles, whose 14-32 record is a half-game worse than Ricky's boys. The O's will be here for four games. The Cubs also will be home this week, entertaining the Cleveland Indians in a match-up of the 2016 World Series contestants. I couldn't resist asking Smith and Reszel if they ever go to Wrigley Field. "Absolutely not," said Smith, "unless we're forced to at gunpoint."